It was a little over two years ago when Saara Punjani and her brother, Ali Punjani, made their first sale to a multinational drug company from a “random meeting room” at the University of Toronto’s Bahen Centre. At the time, Structura Biotechnology was barely even a startup. But what the Punjanis lacked in airy office space and slick marketing materials, they more than made up for in potentially transformative technology that could help find drug treatments for ailments that range from Alzheimer’s to cancer. 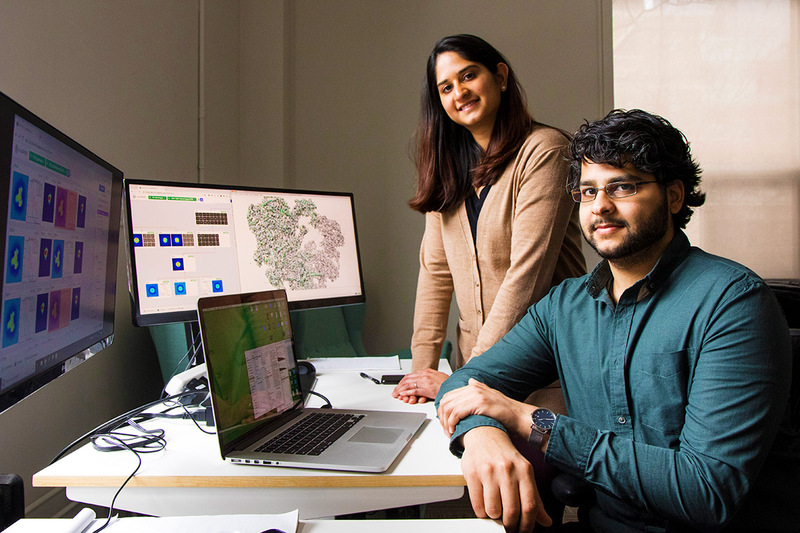 Their startup’s software, based on Ali’s research and designed by Suhail Dawood, uses artificial intelligence, or AI, to render 3D visualizations of proteins in the human body. Each one is carefully assembled from millions of images captured through a relatively new, Nobel Prize-winning technology known as cryo-electron microscopy, or cryo-EM for short. In essence, Structura is billing its tool as cryo-EM’s killer app – one that will allow pharmaceutical companies to fully realize its drug-discovery potential. "Proteins make every process in your body happen, and drugs are these small molecules that have to bind to proteins,” says Ali, who is currently working on a PhD in the University of Toronto’s department of computer science. In effect, that’s how the pharmaceutical industry has been forced to approach the problem for decades – which is among the reasons why finding and creating effective new drugs can take up to 10 years and cost billions. While X-ray crystallography, an existing technology, already allows scientists to view protein structures, its application is limited because it can only be used on the small fraction of proteins that can be crystallized. By contrast, cryo-EM can be used to visualize nearly any protein, making it potentially far more powerful. But there’s a hitch. In order to capture images of protein molecules, cryo-EM involves freezing millions of protein specimens in a solution (the cryo part) and then gently shooting electrons at them (so as not to destroy them, as tends to happen with traditional electron microscopy). The challenge is piecing together the resulting images into an accurate 3D model. That’s because proteins are extremely complicated structures, and the images generated through cryo-EM are noisy, two-dimensional and capture proteins in a variety of random orientations depending on how they were suspended in the solution when it was frozen. To overcome the conundrum, Structura’s tool – called cryoSPARC – relies on a combination of computer vision and machine learning to come up with a representation of the protein’s shape and structure (a ribosome is at left). This not only makes it easier for scientists to potentially identify drug molecules that might bind with it, but it also determines how strong those interactions are – and therefore how effective the resulting drug might be. Calling it the first commercially supported software solution of its kind, Saara says CryoSPARC allows scientists to accomplish in a few hours, on a single work station, what could otherwise take weeks with a cluster of computers – if it could be accomplished at all. Working out of a small office at U of T's Banting building, Structura has already signed deals with several multinational pharmaceutical companies and has made the technology available for free to universities around the world. The hope is that cryoSPARC one day becomes a key part of the drug discovery pipeline – all while helping to advance understanding of human biological processes. “We want to take cryo-EM out of the realm where you have to be an expert to obtain useful information, which is the 3D structures you're interested in,” Saara says. Structura’s origins go all the way back to Ali’s undergrad at U of T, where he studied aerospace engineering. In his third-year, he approached David Fleet, a professor in the department of computer science and U of T Scarborough’s department of mathematical and computer sciences. “Basically he walked into my office and said he wanted to work in my lab,” Fleet recalls. Though usually reluctant to hire undergraduate students, Fleet says he was struck by Ali’s impressive resumé and sharp mind. He soon brought him aboard, kicking off a research relationship that would lead to several co-authored papers. It wasn’t long before Ali zeroed in on cryo-EM, which he had been working on with Marcus Brubaker, who was then one of Fleet’s post-doctoral students. The two ended up founding Structura in 2016, with Fleet as an expert adviser. Yet, incorporating a startup is one thing. Turning it into a real business is quite another. Swamped with his academic work, Ali says he didn’t have the capacity to turn his research into a commercial product by himself. So he called on his sister for help. At the time, Saara had just finished her articling year at a top Bay Street law firm, and was looking for a change. She offered to help Structura write grant applications and was soon co-leading the company. What’s it like putting in all those long hours with your sibling? With Saara on board, Structura was now off and running – and its timing would prove fortuitous. In early 2017, Ali, Fleet, Brubaker and John Rubinstein, a senior scientist at the Hospital for Sick Children and professor in the departments of biochemistry and medical biophysics, co-authored a study in the journal Nature Methods about the algorithms behind cryo-SPARC, drawing significant interest from the academic community. Around the same time, Structura applied – and was accepted – to U of T’s UTEST accelerator, which helped them build out the beta version of their product. "They were very supportive of the idea and gave us an initial seed investment, so that allowed us to hire our first couple of employees in the beginning of 2017,” says Saara. The final piece of the puzzle fell into place in October of that year. That’s when the scientists behind behind cryo-EM won the Nobel Prize in chemistry, setting the field abuzz. It wasn’t long before the pharmaceutical companies began reaching out. Ali and Saara recall running around the Bahen Centre with Dawood looking for empty rooms where they could demo their software, via Skype, with some of the biggest, wealthiest companies on the planet. "We were pretty homeless at that point, and we were having these conversations with giant pharma companies,” Saara recalls. “We we're like, 'This is all out of our league. If they knew we were just sitting here in a [borrowed] conference room, would they take us seriously?" They needn’t have worried. One multinational pharma company, who Saara describes as having an “innovative mindset,” wanted to license an early version product – essentially forcing Ali and Saara to come up with a business model on the fly. There are, of course, still challenges on the horizon. Ali, for one, says the pharmaceutical industry has a tendency to view scientific software as an efficiency tool as opposed to a core part of their businesses, making them reluctant to spend much money on it. That’s particularly the case with AI tools that make predictions about drug candidates, he says, since it’s ultimately the drug companies who must pay millions to test whether those predictions are accurate. "We're not doing that,” Ali stresses. “Our software is providing answers that are verifiable and real image data that you can see." Saara goes one step further, suggesting tools like cryoSPARC are as core to drug discovery as cryo-EM itself. "We want to convince people that, unless you use this computational reconstructive process, you don't actually have a solution,” she says. “You might have prepared samples and taken pictures, but what do you actually have at the end of the day?" With most of its customers finding the company through academic channels, Structura’s plan for 2019 is to ramp up sales and marketing efforts. The startup has so far relied on a boot-strapping model, preferring to grow organically by increasing sales as opposed to soliciting money from venture capital investors. Ali figures that cryo-EM will one day be at least as big as X-ray crystallography, meaning “a multibillion-dollar market,” and he’s hoping Structura will be at its centre. In his view, Structura could one day become a biotech-like firm that actually discovers drug candidates or, perhaps, a platform to carry out drug research for pharma and biotech firms. "We are maximally ambitious,” he says. “What we really want to see is the process of making medicine for people become as easy as it possibly can. “We want to contribute as much as we can to the discovery of medicine and the understanding of life."